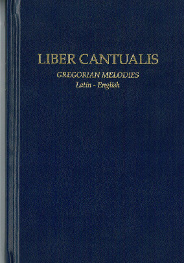 The first edition of the Liber Cantualis was published in 1995 and has been re-edited mainly to achieve a good English translation of the texts. It contains the most familiar chants of the Mass, and four examples of the Alleluias. A second part contains chants for the sprinkling of Holy Water at Sunday Masses, seven easy to sing settings of the Ordinaries (Kyrie, Gloria, Sanctus, Agnus) two Credo (Creeds), Mass for the Dead, and the best known Sequences: Victimae Paschali Laudes, Veni Sancti Spiritus, Ecce Panis (Lauda Sion), Stabat Mater; a third part includes various chants in honour of the Blessed Sacrament, Our Lady and also chants for different liturgical Seasons, Gospel texts (Magnificat etc) a few psalms and the complete office of Compline. Many different countries and parishes use pieces in Latin and Gregorian chant. This little book, with an English translation, may be of great help.